Whenever we think about a garden, we often imagine a green lawn, lush flower beds, old fruit trees, shrubs, and bushes. But to create a beautiful and classic space, one can also opt for a steingarten. 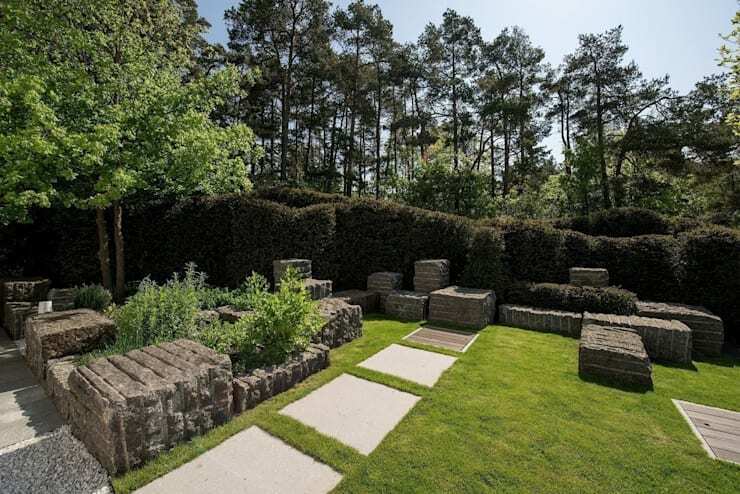 Steingarten is a type of stone garden with modern features. These gardens not only look great but are also easy to maintain. Steingarten's can be found all over the world including England, Japan, France, and Mexico. They are the best alternatives for your traditional style lawns as they radiate an exquisite charm. To help you select a beautiful design we have created a stone garden picture gallery that you must consider. By opting for a Mediterranean style theme, you can create a healthy outdoor environment in your garden. Mediterranean stones can withstand any climatic condition which makes it easy for you to maintain a steingarten. These stones also create optimal growth conditions which mean you can grow a large variety of plants including, Steinkraus, Wolfsmilch, Thistles, Dwarf Pines, Lavender, Sage, and also Melissa. The bright colour of these stones can be complemented by using matching accessories such as wrought-iron, patio furniture, and terra cotta planters. As in the Mediterranean, green meadows and lush gardens are rather unusual in Mexico. Therefore a steely variety is a perfect choice for those who want to decorate their outdoor area with regional plants. Such stone garden ideas will also save you from the process of gardening under extreme heat. 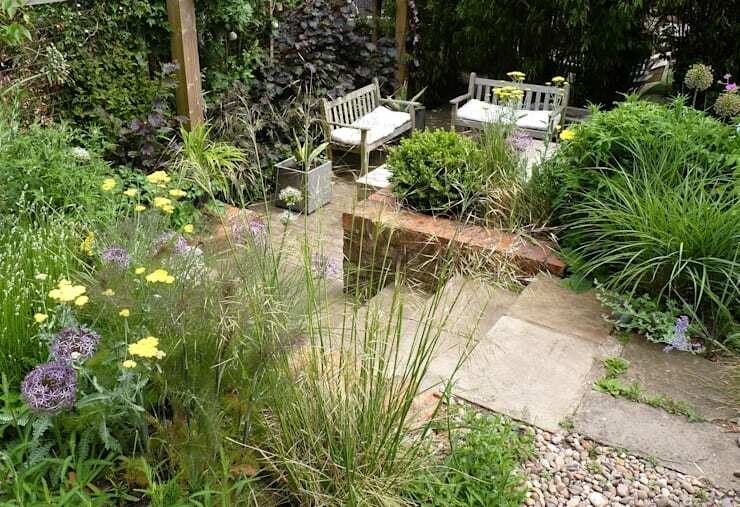 Gardening in such zones is simple as local plants can quickly adapt to extreme conditions. Also, weeds do not grow in such weather which makes it all the more easy for you to maintain your steingarten. 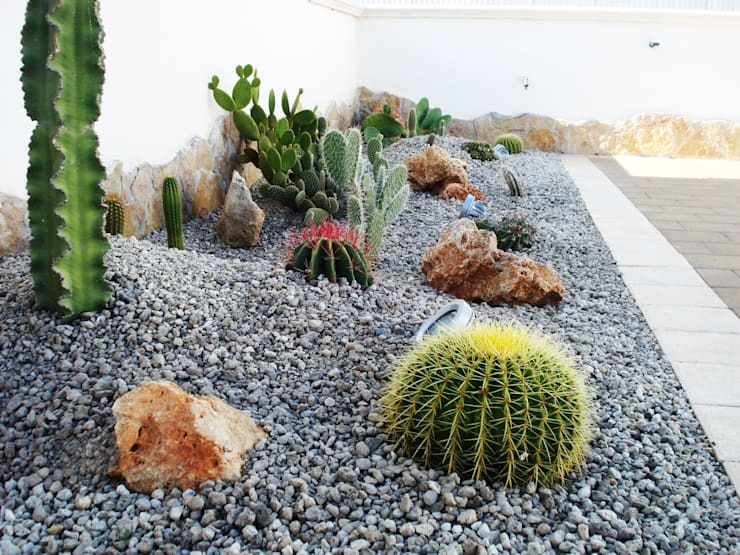 Plants like cacti and succulents can also be grown in places with water shortage and harsh heat. 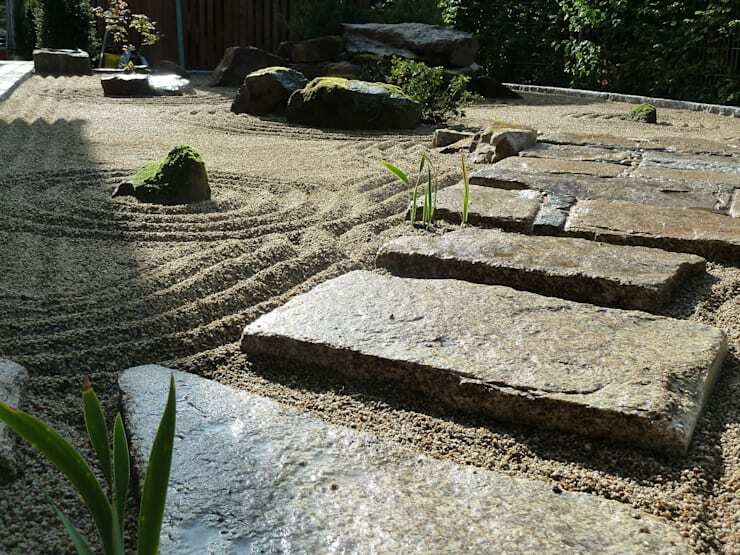 In Japanese zen gardens, stones are considered to be an essential element of the design. Plants play a subordinate role here while gravel, sand, and rock take the primary position. They are not only beautifully arranged, but they also radiate a soothing, meditative, and symbolic character. A steingarten in Japan stands for the circle of life, god, mountains, water, animal, and harmony. To mark their importance and provides serenity unique wood current wave lines are created into the gravel or the sand. It is also crucial that the beginnings and ends of these lines are completely invisible. Achieving the gentle transition between the gravel and the large stones is the perfect way to lay out a stone garden. 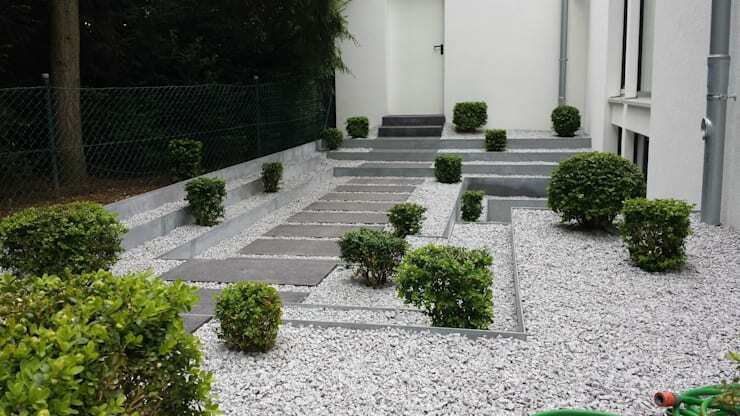 If you like modern, minimalistic, and sleek designs, then this layout created by SUDDEN Gardens and Landscapes in Krefeld is an ideal choice. This courtyard is an excellent example of a stylish place which can manage without a lawn and still make a good impression. Bright gravel, clear lines, corners, edges, and square shapes are used throughout the design. For incorporating a fresh green accent separated bux and egg elements have been used generously. The elevated flower beds also make the space more beautiful. For those of you who want a chic looking garden with less colourful flowers than the English steingarten is an excellent option. Stone garden pictures of English Steingarten's can help you create a unique outdoor area for yourself. The use of structuring rocks and wild plants creates an idyllic and natural oasis under the open sky. One of the oldest and still used steingarten in Europe is located in Chelsea's and is known as Physic Garden. It was created in 1773 and is now protected under the monument conservation laws. Individual stones left in the park were also used during the construction of Tower of London so that they could be rescued. 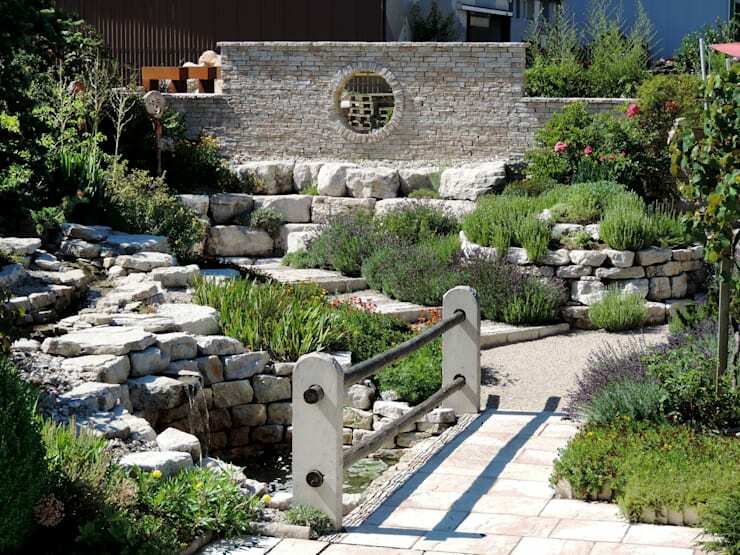 The combination of rocks and water has always been popular with garden designers. Whether one leaves both elements in their natural form or interprets them in a straight forward or new manner, it all depends on the individual's taste. Therefore each interpretation gives out a different and unique result. 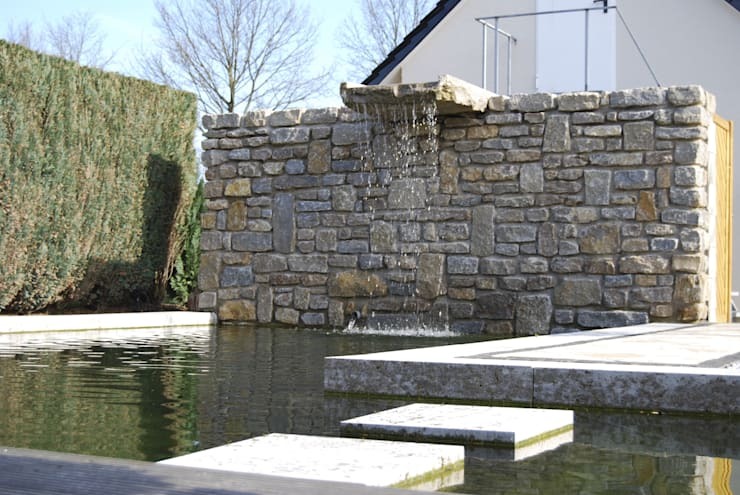 In this picture, we can see a pond which includes a stone wall and a waterfall giving it a fabulous appearance. Apart from this geometrically shaped stones were also used to create a beautiful walkway. Another popular choice when it comes to creating a garden is wood. In this steingarten, gravel and stone beds are laid on both sides of the wooden path which is further accessorized with different plants. The entire garden has been created using natural wood along with colourful plexiglass dividers. During the night a sophisticated lighting creates a relaxing ambiance making it the perfect outdoor space for any home. Adding stones to your garden does not mean that you cannot have a proper lawn. On the contrary, the gray colour of the rocks and the lush green lawns create a harmonious appearance and an appealing contrast. In this picture, we can see that massive granite blocks have been placed side by side which could also be used for outdoor seating. In addition to this, a herb garden was also created in between these blocks. The overall result showcase is a rustic yet modern garden. 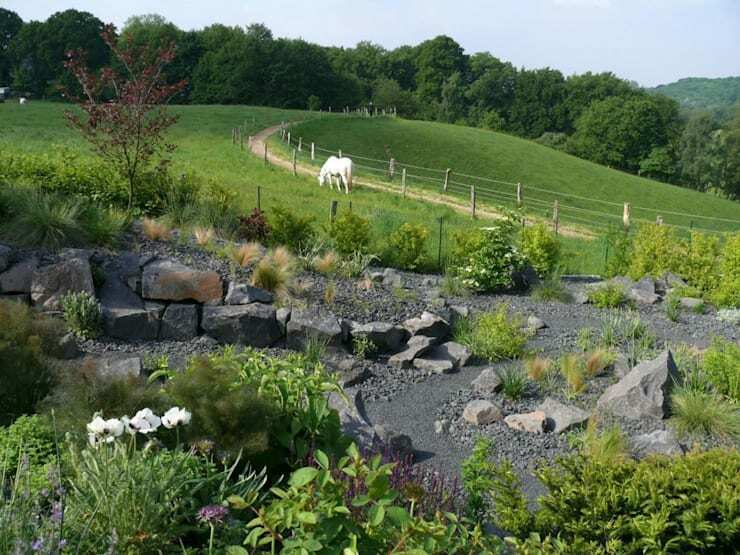 Creating a green space on a hill can be a challenge which is why we suggest that you opt for a stone garden on a slope. These gardens turn out to be a fantastic choice especially if placed in dry soil and a sunny direction. Also, the slopes also create the perfect drainage condition making the garden look beautiful. Adding grass to these stone gardens can reduce the rough edges of the material making it look harmonious. However, one needs to remember that the opted plants must have strong roots so that they can hold onto the rocky slopes. This picture proves that even animals feel safe in a stone gardens or steingarten. 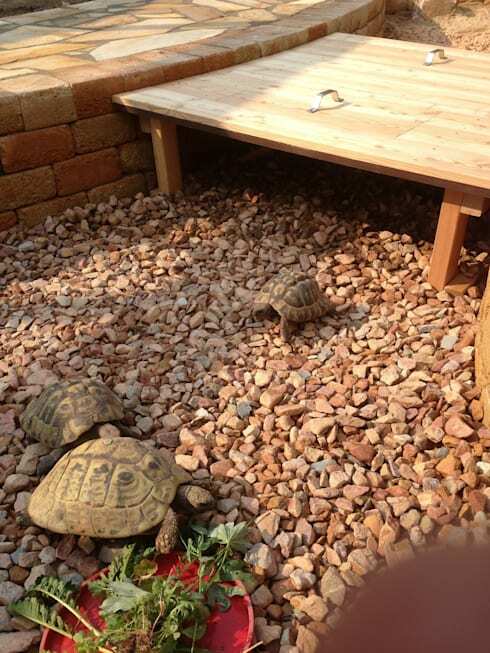 It is a turtle garden which was planned and created by our exports from Kersten for a family and their beloved pet. 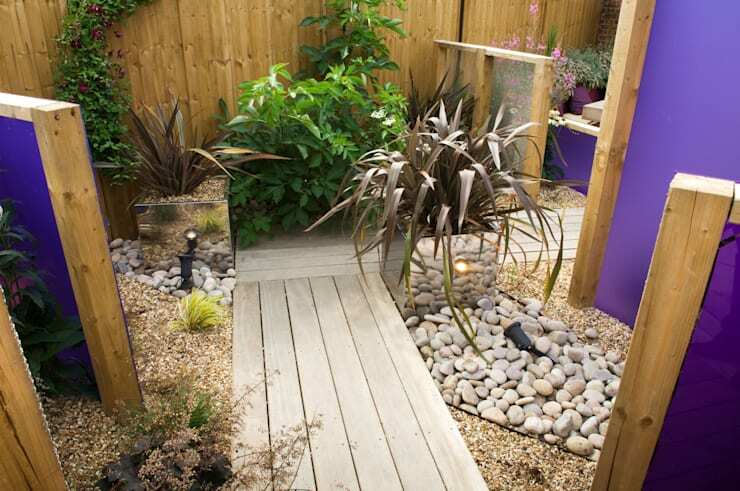 In this charming enclosure, the designers have added other natural materials as well apart from the stones. These plants were chosen so that they could adapt to the needs of the animal and provide an elegant finish. Which one of these stone gardens was your favourite?